Homeline Building Products has been awarded ISO14001 for its green credentials and environmental responsibility. The company also attained recognition as the UK’s first roofline manufacturer to launch a BBA accredited recycled roofline system. The ‘Core’ range of fascias and soffits are virtually indistinguishable from Homeline’s standard range but are manufactured with an inner core of recycled PVC-U encapsulated within a virgin shell to produce the perfect finish. 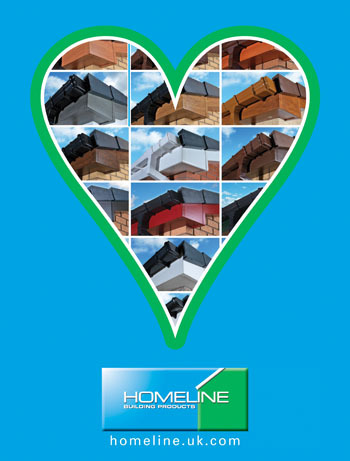 Julian Allen, Homeline’s group manufacturing manager said: “It has always been our firm intention to drive forward with our goal of producing a range of environmentally friendly PVCU building products to distribute across the UK, meeting the demands of both retail and commercial customers. “Achieving ISO 14001 – in addition to a further investment in our mixing plant to produce our recycled roofline – demonstrates our commitment to environmentally responsible manufacturing. “This achievement is testament to all the hard work and dedication shown by our team at Homeline Building Products, and emphasises the company’s commitment towards continuous improvement in everything it does”. A premium range of windows and doors that is future-proof to 2019 has been launched in the UK by Kawneer. The AA720 series comprises a tilturn, inward-opening side-hung and bottom-hung, tilt slide, vertical and horizontal pivot, top-hung casement, inward and outward-opening doors, folding/sliding door and a fire-rated door and fixed light. The range, with U-values as low as 0.9 W/m²K, is expected to outperform the anticipated requirements of the 2013 and 2016 Part L amendments to Building Regulations. The windows are available in four levels of thermal performance – the AA720, AA720 HW, AA720 HI and AA720 HIPlus. The series of wider 72mm profiles incorporates the very latest thermal technology including extruded polyamide and ABS thermal breaks, insulated centre seals, foam isolators and foam core insulation. The doors are available in two levels of thermal performance – the AA720 and the AA720 HI. Here, the series of wider 72mm profiles incorporates extruded polyamide thermal breaks and foam core insulation. Expected to supersede the AA600TE series as Kawneer’s flagship range, the AA720 series is based on a range that has performed in Germany, an even more onerous market, regulations-wise, for several years, becoming Kawneer’s best-seller there. Its launch in the UK has required the largest-ever investment in new dies at Kawneer’s factory in Runcorn, Cheshire. The windows encompass a wide variety of configurations – the standard window with traditional straight contours, and five new variants – the softline with rounded contours particularly suitable for residential applications, the integral (concealed vent) with narrow sightlines and visible aluminium facets on the vents, the renovation with angular or chamfered contours, a narrow sightline window for the replacement of steel heritage windows, and a curtain wall lookalike. 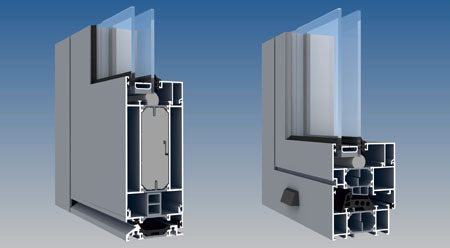 The doors comprise a standard door with straight contours that is available in open-in and open-out variants, a design door with rounded and angular contours to suite with the softline window for residential applications, and the AA720 FR fire-rated system for doors and fixed screens which has been tested to 30 minutes for integrity and insulation. All the windows and doors offer extensive hardware configurations including new concealed hinges and barrel hinges for entrance doors as well as a wide variety of handle and locking options. Movember is a time when men grow moustaches to raise money for men’s health charities. However, this year, Knauf Drywall’s Beardtober beat it to the charitable finish by a hair’s breadth. The company renamed the tenth month ‘Beardtober’ and sought to bristle with facial hair from the first and until the beginning of that boring old Movember in order to raise money for Prostrate Project. And that objective was met in whiskery style, with the company raising over £7,000 for the charity. “The idea was that anyone in the business who can grow facial hair should do so and donate £25 to The Prostate Project for the privilege, while raising sponsorship from friends and family, as well as ‘non-growing’ colleagues, customers and suppliers,” explained Ian Dean, sales and marketing director. To best judge who produced the best beard in Beardtober, all Knauf Drywall participants participated in a controlled ‘shave off’ on September 30th – with David Riddell, national account controller, receiving an award for sprouting the most prolific set. There was also an award for the worst beard and this was given to Dan Dixon, flooring business development manager. 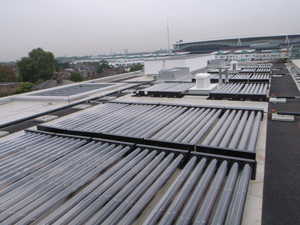 Mitsubishi Electric is using the roof of its three-storey headquarters in Hatfield to significantly lower its carbon footprint by generating electricity and earn income from the Government’s Feed In Tarriff (FIT) scheme. The company has installed a photovoltaic (PV) system with a net install capacity of 49.4kW using the latest hi-efficiency, monocrystalline PV modules – the MLT255HC – and these are now expected to deliver over 42,000 kWh per year with a CO2 saving of over 22 metric tons. The two roof sections of the L-shaped building are typical flat roofs with a waterproof membrane covering and in order to avoid penetrating this membrane, Mitsubishi Electric has used a ballasted A-frame system designed and supplied by Big Foot Systems. The installation was completed by Mitie Energy, the strategic outsourcing and energy services company and the modules are pitched at 10° and orientated at 30° east of due south – a configuration which maximised the use of the available roof space. A Fronius CL48 three-phase central inverter, which has a nominal ouput of 48kW, links the PV array to the building. As a major player in the PV industry, we thought we should take advantage of the huge flat roof we have here at our Hatfield headquarters to highlight how simple these systems are to install and just how much carbon can be saved and how much electricity generated,” explained Perry Jackson, general manager of the company’s photovoltaics division. The company is monitoring the performance of the PV system using a Fronius Datalogger web monitoring system. This displays real-time and historical data on a web page that can also be accessed by Mitsubishi Electric’s customers. Quotatis has opened a new UK based call centre to cope with the growing volume of leads and subscribers the company now handles. At present 15 staff work seven days a week to qualify the leads received from homeowners seeking the services of the qualified trades people registered with Quotatis, a number that will be increased in the New Year. Every enquirer is contacted and asked key questions about their enquiry, after which the leads are passed on to subscribers. 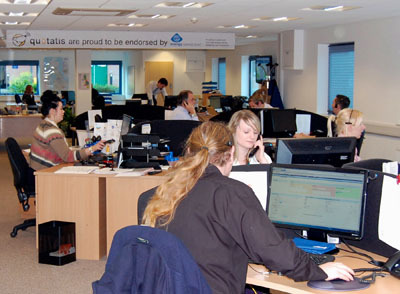 The opening of the call centre, which is based at the Quotatis offices in Norwich, follows an increase of more than 40% in the number of leads received by the company. There has also been significant growth in Quotatis’s subscriber base as more tradespeople and contractors are experimenting with online lead generation, finding that the costs and quality improve upon their alternative methods. Quotatis offers a 'pay-as-you-go' system of providing business leads with no join up fee or contract. This offers subscribers control, with businesses paying for as many leads in their area as they require and without any commitment. Quotatis has also promoted Janet Small to the post of national sales manager with a replacement team leader being recruited to head the customer service and sales team. Scott Wilson will be responsible for 12 staff in this area. 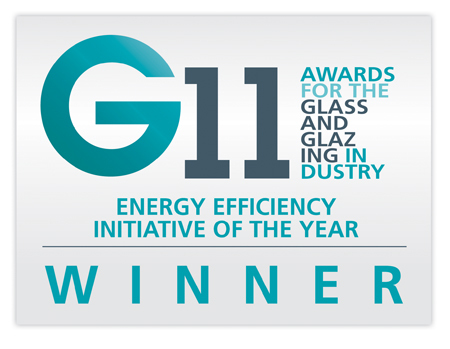 Rehau won the Energy Efficiency Initiative of the Year award for its Rehau Geneo Passivhaus certified window system and 0.8 triple glazed window with Rehau Thermo insert at the recent G11 awards. Wolfgang Gorner, business unit director at the Rehau Window Division, said: “Rehau Geneo is a really exciting innovation – not just a new profile design but also a new composite material which showcases the very best of Rehau’s product design expertise. “Over the past year, we’ve successfully introduced Rehau Geneo into the UK, established a network of fabricators in England, Scotland and Wales and completed a number of high profile contracts in both domestic and commercial projects. “It demonstrates perfectly the benefits to our customers in the UK of Rehau’s strategy of applying successful product platforms across several markets and of using our experience in one market to inform our development in others. Synseal was nominated and shortlisted for the Green Manufacturer of the Year Award at the ‘Insider Made in the Midlands Awards’, a scheme that rewards the work of the region’s manufacturers. The Awards Presentation Dinner was held at the Ricoh Arena in Coventry on Tuesday November 2nd. “Synseal are delighted to have been nominated alongside such a respected group of manufacturers that included Jaguar Land Rover, Morgan Motor Company, AGA Rangemaster Group, Wade Ceramics and SI Group to name a few,” production director Robin Byron said, who attended the event with HS&E manager Glenn Evans. Synseal impressed the judges with its environmental strategies that include: a year-on-year reduction in energy consumption of 8%, producing an average saving of 600 tonnes of carbon; a 30% reduction in vehicle emissions through the introduction of 34 new delivery vehicles; and the on-target achievement of zero waste to landfill by the end of the current year. The recent headline grabbing changes to the Feed In Tariff has left the consumer in the dark, and it is now more critical than ever to restore consumer confidence and provide an accurate calculation of the financial benefits of installing Solar PV, Ecovision has claimed. Ecovision has developed a Solar Calculator, which should put to a rest any ‘false’ calculations that some companies have been claiming. “Inflated savings and inaccurate installation costs have left many disappointed,” the company said. “Ecovision provides the only service on the internet which quickly and simply works out how much a roof can earn and at what cost. • The largest possible solar panel system that can fit, what it will cost and the income it will generate. • The most efficient solar panel system that can fit on the roof, what it will cost and the income it will generate. • The quote will include the installation cost, annual tax free payment to you and totals that figure over 25 years at an index linked inflation rate of 3%. The income is made up of the annual FIT, the annual export benefit and the annual savings benefit. Ecovisions have reacted to the Government’s revised Feed In Tariff with a measure to ensure that consumers committed to reducing carbon emissions and electricity bills can still get maximum benefit from the FIT. With a significant £5,000 reduction in the installation costs to £9,495, the payback is 10 years with 15 years of tax free profit. “I wanted to create an online tool that could calculate the cost and return from solar panels, of the total or part portion of an individual’s roof space offering the most beneficial solution not just the largest,” Jeff Ryder Ecovision project manager said. Fakro’s FTT pivot roof windows offer exceptional heat transmission co-efficients, having been designed to meet the requirements of energy-efficient buildings such as those built to Passivhaus standards. Glazing units are set in specially designed wider sash frames which minimize the potential for thermal bridging. With a 50mm thick glazing unit, the FTT U8 Thermo quadruple-glazed roof window has a U-value of 0.68W/m2K, while that of the triple-glazed FTT U6 is 0.81W/m2k. Both have a glass U-value of 0.3W/m2K. Though of pivot design, the axis of rotation of some FTT sashes has been raised to enable even a tall person to stand comfortably by an open roof window. FTT windows benefit from a quadruple-sealing system using flexible thermoplastic elastomer (TPE) which limits air leakage. As a result, when closed both the U6 and U8 provide a 38 dB acoustic performance. FTT roof windows can be installed in pitches between 15º and 70º and the sash can be positioned at any point between 0° and 45°. Unlike the relatively open-grain whitewood pine used by some manufacturers, the timber used to manufacture the FTT is exclusively slow growing, close-grain, redwood pine which is guaranteed to be knot-free. With the additional benefits of vacuum pressure treatment and use of a three-coat matt lacquer finish the timber keeps its appearance for years. Through use of a modified locking mechanism which secures the sash either side of the frame, the patented topSafe system provides an exceptional standard of security and safety – Class 4 EN13049. Litchfield Group’s Sheerframe, Masterdor and ICF Tech products were successful in the 2011 Housebuilder of the Year Awards. The trio of low-carbon building products form the structural envelope of homes at Brookwood Farm – the Code level 5 social and private housing development in Woking. The scheme, by the William Lacey Group for Woking Borough Homes, won best low or zero carbon initiative at the Housebuilder of the Year Award which were presented by comedian Alexander Armstrong earlier this month at the Millennium Mayfair Hotel in London. 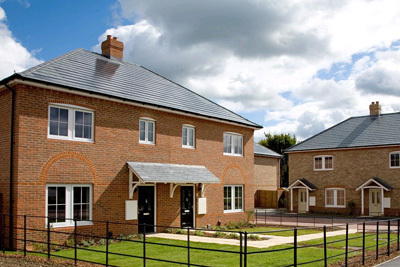 In total there are 12 homes at Brookwood Farm, of which ten are ‘affordable’. The combination of ICF Tech walls, Sheerframe zero carbon HED windows and high performance Masterdor entrance doors, all designed and produced by the Derbyshire-based Litchfield Group of Companies, provides the structural framework on which the new homes’ code level performance is based. Litchfield Group managing director James Litchfield said: “There’s still plenty of talk in the industry about the best ways to meet zero carbon specifications. Our system is already helping to deliver new homes to this standard. The three-step building system from The Litchfield Group, which brings together the proven technologies of thermally superior ICF Tech walls, Sheerframe windows and Masterdor doors for the building envelope, is easy to construct, even in challenging weather conditions. Walls can be clad or faced to look exactly like a standard red brick and block construction from the outside but they’re dual skinned with ICF Tech’s insulated concrete form walls, which offer U-values as low as 0.11W/m2K, air infiltration performance which meets Code level 6 standards, and a Y value as low as 0.013. Sheerframe PVC windows with a low 0.8 W/m2K U-value and Masterdor door sets – which are all UK-designed and manufactured specifically for British homes – integrate with the walls to maximise thermal efficiency, air tightness and security. Sirius SAT from Potterton Commercial is a range of Heat Interface Units (HIU) for the provision and control of heating and hot water within each dwelling of a residential block of flats that is served by a centralised plant room. Suitable for use in local authority building stock, a centralised system removes the necessity for individual boilers within each dwelling, allowing quick and easy access for maintenance. This method of heating also results in reduced installation costs, no flues or visible plumage and reduced annual appliance service charges. Furthermore, it is easier to integrate Low/ Zero Carbon (LZC) energy solutions, like the Andrews Solarflo solar thermal system, the benefits of which can be distributed to all the residents. 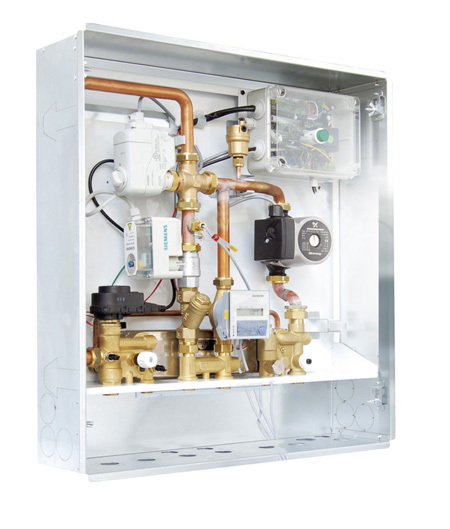 The Sirius SAT HIU range includes eight models, depending on the size of the residential block and whether domestic hot water is required in addition to heating. No matter what size they are, the units are all compact and can be installed where space is limited, ensuring ease of installation. For dwellings with larger hot water loads, HIU models are also available for integration with hot water cylinders. One of the technologically advanced benefits of this product is its heat consumption meters that have the option of being able to transmit data by wireless, allowing the local metering of heating and hot water consumption in each dwelling to take place from one single position. This reduces meter reading costs and avoids possible reading mistakes. The direct consumption reading is also shown via the clear, digital display on the HIU, which helps to encourage efficient use of heating and hot water by individual residents. Sirius SAT comes with a range of optional extras, including a programmable room thermostat, aerial/receiver, radio modules, weather compensation module and DHW/ cold water meter and pipework loop. 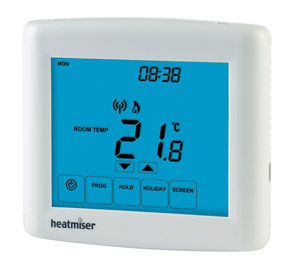 Heatmiser UK has launched its new WiFi Enabled Thermostats that can be controlled via any web browser and the company’s free iPhone app. Four models have initially been launched, including non-programmable, programmable and time clock versions. All are 230v powered and all offer volt free switching, catering for most types of boilers. Heating comfort levels, holiday program and temperature hold functions can all be operated and, apart from a wireless router and broadband line, no other equipment is required to gain access to the system remotely. This range will be extended further in the coming weeks with the release of a wireless switching model – compatible with the UH1-W wireless wiring centre. Nu-Heat is delighted with the response to its rainwater harvesting offer, introduced just over a year ago. Nu-Heat stocks a selection of Roth systems with the best seller currently being the 5,000L package; 3,500, 7,000L, 10,000L packages complete the range. Nu-Heat believes that the Roth tanks are among the best available due to overall quality and two features in particular. Firstly, the tanks are low profile so don’t require such as deep installation pit as other models that have more of a goldfish bowl shape. This also means that the tank can be installed in locations with a higher water table. Secondly, the tank is made from a single moulded piece without seams, ensuring integrity and making installation more straightforward as the pieces don’t have to put together on site. The tank is still relatively light for manoeuvring into position. There is no requirement for a break tank, so no water is stored in the loft, and the only internal installation required is the control unit. Nu-Heat’s unit is comparable to other high spec systems on the market, and pumps water round the system at mains pressure of 3-4 bar. One major advantage of the control unit is that it measures what is in the tank, so when there has been no rainfall and the level reaches a pre-determined limit, the unit automatically switches to mains water. The control unit includes a 9L storage tank, so unlike other models that flood the rainwater tank with mains water, Nu-Heat’s system only holds 9L of mains water in store, so that if there is sudden rainfall, mains water isn’t used unnecessarily. When there is sufficient rainwater in the tank, the control unit will automatically switch the system back to the tank supply. The display on the control unit indicates the status of the rainwater levels and what mode the system is in. Nu-Heat has recently added a number of useful accessories available for purchase to widen the potential for installation. The first is a stronger lid which is suitable for tanks being installed under a drive. The lid is able to withstand a 600kg wheel load. As with any tank installation on a drive, a concrete ring must still be put around the lid so that it doesn’t get pushed down when driven over. A second accessory is a periscope extension. This is for use in situations where a tank needs to be deeper than normal, such as where water needs to travel further from the gutters. The existing periscope is 700mm and the extension is 500mm. Roth’s rainwater tanks are exclusive in the UK to Nu-Heat. Better aesthetics and performance in natural daylighting is being brought to market with the latest tubular rooflight from Passivent. The new Passivent Sunscoop features a square, low profile roof dome. The square profile simplifies installation in all roof materials and eliminates the need to create complex flashing detailing inherent with conventional round roof flashings. The low-profile polycarbonate roof glazing improves aesthetics once installed, minimising variations along the roofline without any impact on the amount of natural daylight entering the building below down the highly reflective tube. A choice of two interior diffusers offers the flexibility to select light distribution according to requirements, be it diffused or a more direct light, whilst optional low energy light fittings incorporated into the diffuser assembly further enable effective lighting even at night without the need for separate electric lighting. In the day, even the 250mm Sunscoop delivers more natural light into the room below than a standard 13W low energy lamp (equivalent to the old style standard 60W bulb), without any electrical consumption. Passivent is also offering tube insulation to the system, which reduces both the risk of thermal bridging and surface condensation. Passivent Sunscoop can be fitted in both new-build and refurbishments. Unlike similar products, its flashing are AA fire rated, enabling unrestricted use regardless of the proximity of adjacent buildings. The roof glazing unit is installed in the roofline, while the highly reflective connector tube directs natural daylight down to the ceiling mounted diffuser in the room or corridor below. The world’s most efficient solar panels commercially available – as certified by the Guinness World Records – are now available to British homeowners. US-based SunPower E20 solar panels have signed a deal with the UK solar panel company, Ploughcroft – the solar roof installation partner for Vaillant, Plumb Center (Wolseley) and NPower. The company is the first in the UK to offer the SunPower E20 panels to British domestic and commercial solar customers. SunPower E20 panels are designed to offer 8% return on investment, based on the new Feed-in-Tariff (FIT) of 21p per kW. Offering high levels of efficiency in the UK (20%), Ploughcroft claims these solar panels provide more power than any other panel currently available and are sure to appeal to savvy homeowners looking for a great return for their money. All this extra technology is packed into a standard size panel (1.5m x 1.05m), resulting in a smaller roof space being needed to achieve great returns. Just 12 E20 panels can achieve a 4kW output (the FIT cap level), whereas currently there needs to be 16-20 panels fitted to get this rate. Chris Hopkins, managing director at Ploughcroft Solar said: “The UK is the world’s fastest growing market for solar technology, and as Ploughcroft is the leading solar installer, then it is fitting that we are able to offer our customers these amazing panels. The ultra efficiency means that even in cloudy or overcast conditions these panels work far better than any other. The cell technology within the SunPower E20 panel is now fully Microgeneration Certification Scheme accredited (awarded 28 October 2011) and offers an output of 333w compared to the industry high of 250w. Chris has recently been appointed to the Green Construction Board (GCB). The GCB consists of government and industry experts who will drive forward the actions set out in the Low Carbon Construction Action Plan. Feed in Tariffs (FITs) still represent a fantastic return on investment, despite the recent reduction announced by the Government, lead generating company Quotatis has claimed. 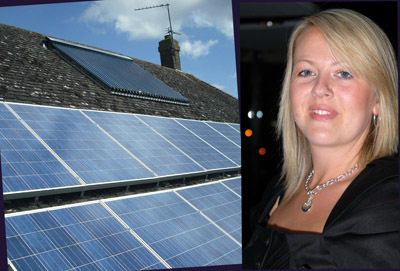 FITs were launched by the government in April 2010 in a move designed to encourage the widespread domestic installation of photovoltaic panels. To this end the scheme has been very successful – there were more than 16,000 new solar PV installations in September 2011 alone – as homeowners have taken advantage of a generous tariff that paid them 43.3p/kWh for every unit they produced whether they used that energy themselves or sold it back to the grid. At the end of October 2011, the Department for Energy and Climate Change announced that FITs would be reduced to 21p/kWh for new projects, and homes would have to prove that they are already energy efficient to qualify for the tariff. “There has been something of a panic following the Government’s announcement to reduce the FITs, which I believe is unjustified,” Teresa Gizzi, Quotatis’s sales director, explained. “FITs make up just a small part of rapidly growing and important industry, and despite people’s fear that it will pull the rug out from beneath it, the opposite is probably true. Teresa went on to explain that looking at the FIT in isolation ignores the many other benefits that energy efficient products bring. “The Government’s other announcement – that homes have to prove a minimum level of energy efficiency before they qualify for FITs – is positive news for industry,” Teresa explained. “You can’t view solar power on its own – generating your own energy is just one piece in a huge jigsaw puzzle of reducing our reliance on fossil fuels. There’s no point in enjoying free electricity when the sun shines, only to whack up the heating when it gets dark. Quotatis was recently endorsed by the Energy Saving Trust to give impartial advice to homeowners on energy saving matters. “This means we can now offer in-depth advice – backed up by the highly respected Energy Saving Trust – on a range of energy saving methods, including double glazing, insulation, replacement boilers and renewable energy,” Teresa said. 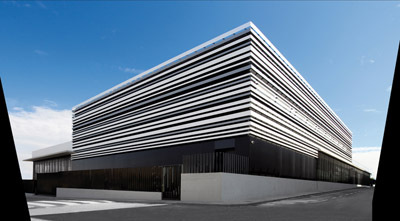 Vivix panels enable architects or specifiers to create a unique building identity or accentuate its architectural elements with either a ‘bespoke’ or unified design, complementing or adding interest to public, cultural or sports facilities. Lightweight, resistant to impact and abrasion and UV and weather resistant, Vivix panels are highly resilient against cracking, do not rot, and include double-sided UV protection as standard. Available in plain colours with sophisticated neutrals and striking accents, nature-inspired abstract patterns and rich woodgrains, Vivix panels can be installed on top of an existing facade, bringing a fresh new dimension and improved performance efficiency to an existing building. Panels from the Vivix range can be used with a variety of fixing systems, from simple timber battens to proprietary metal systems and hung by visible face-fixing or by concealed fixing arrangements depending on the aesthetic requirement. Certified as low-emitting by GreenGuard Environmental Institute, Vivix panels incorporate Formica Group’s commitment to sustainable principles and practices. The German Institute for Construction Technology has given BASF's Styrodur 3035 CS, Styrodur 4000 CS and Styrodur 5000 CS technical approval for multiple layers as perimeter insulation in groundwater [no. Z-23.5-223]. The XPS (extruded plystyrene) boards can be used for multiple layers of external insulation for structural components in contact with the ground (perimeter insulation). Previously, only a single layer of XPS in the perimeter insulation was approved. The approval makes it easier for the construction companies carrying out the work to use the insulating materials and makes it possible to meet the increasingly stringent energy requirements on new buildings. This means that BASF now has approvals from the Institute to install multiple layers of Styrodur C for foundation slabs, inverted roofs and perimeter insulation. Perimeter insulation reduces heat loss at the bottom of a building. Styrodur C is good for perimeter insulation because of its high compressive strength and low water absorption due to its closed cell foam structure and foam skin on both sides. Up to three layers of the insulating material can now be used under non-load-bearing foundation slabs and on basement walls at a total thickness of up to 400mm. 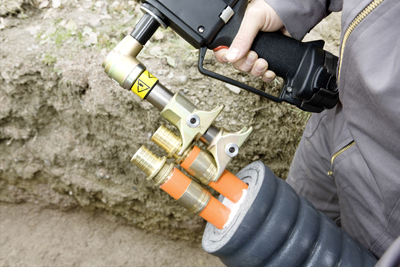 Styrodur C can be immersed up to a depth of 3.5m in groundwater. Carpet & Flooring, a UK distributor of floorcovering products, is the latest member to join Recofloor and increase the number of strategic collection points for the UK’s award-winning vinyl flooring recycling scheme. Established in 1973, Carpet & Flooring has grown into one of the largest distributors, stocking and distributing products from Europe’s leading manufacturers as well as its own domestic and contract floorcovering brands. Having successfully piloted the Recofloor scheme at its Birmingham branch in August, Carpet & Flooring has now rolled it out to the remaining seven branches across the country. “I am delighted that Carpet & Flooring is now participating within the Recofloor Vinyl Take Back Scheme through our national network of branches,” managing director Paul Gordon, said. Recofloor bins accepting waste vinyl off-cuts and waste smooth uplifted vinyl flooring are now located at all their depots in Bristol, Bow, Camberley, Cambridge, Gateshead, Glasgow and Manchester. Flooring contractors and installers can also collect polythene bags from the trade counters for their waste material. When full, these can be left at the depots from where they are sent for eventual recycling into new flooring and traffic management products. 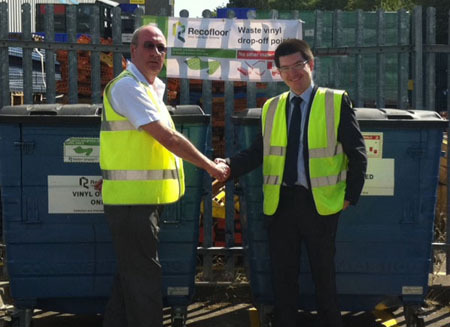 Picture: Andrew Brice, manager of the Birmingham branch (left) with Recofloor’s Matt Charlton. Sheffield-based environmental consultancy Wildscapes has strengthened its team with the appointment of landscape architect Pam Molyneux. 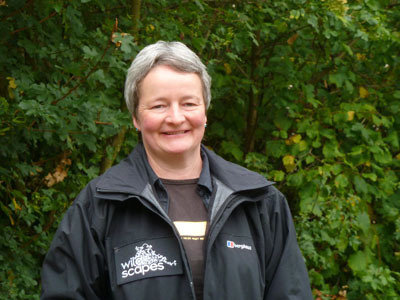 Pam is a Chartered Member of the Landscape Institute (CMLI) and brings almost three decades of experience to the company, which has close associations with the Sheffield Wildlife Trust. This means Wildscapes now provides a comprehensive design and build service, which means essentially being able to meet all requirements for green infrastructure projects. Pam has previously held roles within both the public and private sectors and has worked with communities to design and implement landscape schemes, such as play areas, educational grounds and ‘grow your own food’ initiatives within towns and cities, as well as winning an award for her design work on urban car parks. After beginning her career with a private consultancy in Liverpool, Pam moved on to work at West Midlands County Council and then to Leeds City Council, where she spent 23 years before taking a career break to study for a Masters Degree in Resource and Environmental Management. Pam’s skills include ecological surveys, ground maintenance, land management and landscape creation services across the Yorkshire and Humber regions. The company’s clients include developers, schools, local authorities and the commercial sector, and it specialises in creating landscapes which improve the environment for people and for native wildlife. 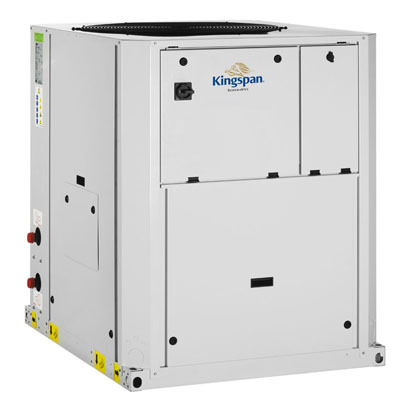 Kingspan Renewables has launched a brand new Aeromax Plus Air Source Heat Pump range designed specifically for commercial applications. The high-temperature, air-to-water heat pumps can extract heat from outside temperatures as low as -20˚C, providing up to 100% of Space Heating and hot water requirements all year round. The launch follows the success of its domestic Aeromax Plus package. The new commercial range offers quick and easy installation matched with low noise levels and economical operation, with high energy efficiency (COP) ratings. The heat pumps form part of a complete package solution, custom-made to suit the needs of each application and are suitable for both new-build and refurbishment projects. For maximum efficiency, they can be partnered with Kingspan’s range of Albion and Manchester Calorifiers, specifically designed for commercial and industrial use, or with its Heat Pump Only or Heat Pump & Solar Input cylinders, for smaller system requirements. Aeromax Plus Air Source Heat Pumps will reduce CO2 emissions by up to 50% compared to traditional systems. These substantial carbon reduction savings will aid organisations participating in the CRC Energy Efficiency Scheme, significantly reducing their mandatory payments to the government to cover emissions. The heat pumps generate renewable heat for radiators, fan coil and underfloor heating systems, as well as consistently meeting hot water needs at temperatures of up to 65˚C. They are suitable for a wide range of commercial applications, from offices, apartments and hotels through to large-scale industrial use and are available in seven outputs. The 2011 Global Cleantech 100 list features Kebony for its award-winning wood material – a product providing a solution to the use of endangered tropical timber and toxic treated woods. Kebony was selected from thousands of entries and listed in the ‘Materials’ category against its achievements in innovation, market size and growth, and the resources to execute its technology. The Norwegian company uses a patented environmentally friendly process of ‘Kebonization’ to permanently enhance wood properties – the result is an alternative to the unsustainable use of tropical timber and environmentally damaging toxic treated woods used in the built environment. Kebony’s wood material has a wide range of applications including decking, cladding, roofing, windows, indoor and outdoor furniture, yacht decking and other construction materials. Recent projects include four sustainable beach shelters at Bexhill, the company’s first UK residential project Hurst Avenue in Highgate, and the Yarmouth Harbour redevelopment – a sustainable marine development and the first UK harbour installation to use Kebony’s decking material. “It is a remarkable achievement to be featured for the second year running in the Global Cleantech Top 100 list. Our revolutionary technology provides an aesthetically pleasing eco-solution to the major environmental challenge of rain forest deforestation,” Christian Jebsen, CEO of Kebony. A new CPD seminar approved by RIBA and the CPD Certification Service, has been introduced by Kingspan Benchmark to examine the development of prefabricated insulated panel systems in unitised buildings. The new CPD seminar created by Benchmark, discusses the benefits of off-site build wall units that can be over 7m high by 3.5m wide, combined with on-site ‘dry’ construction, allowing quicker and safer installation, greater predictability in work schedules and simplifying compliance with new regulations. 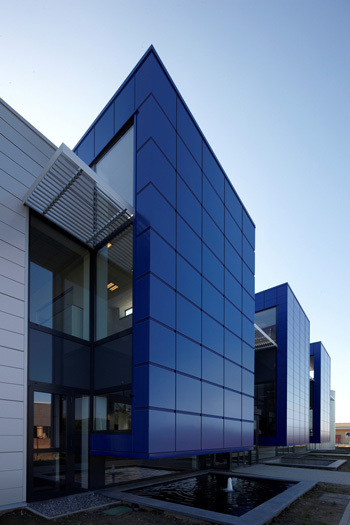 More specifically it looks at how insulated panel technology has developed from industrial cladding into a more advanced unitised system compatible with a large range of architectural facades from Kingspan Benchmark. In this new unitised wall system, insulated panels are designed to operate as complete wall infill panels bolted to the main steel or concrete frame. This eliminates the need for any secondary support structure and enables spanning from floor to floor by using the wall as a diaphragm between the fixed frame. As a result the system is able to support a wide range of external facade options without the structural complexity of other approaches. The system is highly durable and has outstanding thermal performance allowing the system (excluding façade) to achieve U-values as low as 0.095W/m2K. Furthermore, because the unitised wall system is installed using mechanical handling, large modules can be fitted quickly and safely without the need for scaffolding, weatherproofing the building and allowing follow-up trades to begin internal fitting while the facade is being installed. Pramac’s MCS accreditation means the company is now in a position to take a share of the developing UK market, in addition to its existing European and Global markets, the company said. According to the company, Pramac’s panels are suitable for UK conditions – the high technology panels can produce higher annual output than the more common mono and polycrystalline panels. The thin-film Micromorph moduleLUCE MCPH P7 operates for longer throughout the day as they are designed to be more effective in typical UK weather conditions, and be less affected by temperature than the majority of other PV panels. Knauf Insulation is able to offer a comprehensive SAP calculation service via its Technical Advisory Centre (TAC), to help specifiers comply with legislation, particularly in relation to Part L of the Building Regulations and Section 6 of Scotland’s Building Standards revisions. The service offered by Knauf Insulation takes responsibility for providing SAP calculations against all construction drawings and designs, and offers peace of mind to specifiers, contractors and developers for compliance with the Building Regulations. 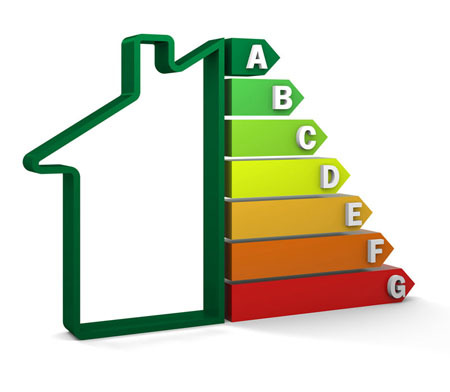 Knauf Insulation's accredited SAP assessors will help calculate the planned energy usage of a building and where specification does not meet regulatory requirements, the experts are able to provide assistance and recommendations to help reduce carbon emissions and meet the regulations. Installers who want to find out more about Rehau’s range of pre-insulated pipework for district heating, remote CHP, biomass and heat pump applications can now register for a free training course to be conducted either at their own premises or even on site. The course covers both the Rauvitherm and Rauthermex pre-insulated PE-Xa flexible pipes and includes key aspects such as fitting the Everloc leakproof jointing system, using the Rautool installation device and making insulated shrouds. It also covers maximum coil sizes and bending radii as well as back filling and pressure testing. Designed for both first time and existing installers of the single and dual pipework systems, the course can be undertaken as part of the process of becoming an approved installer of these Rehau products. CVO Fire has extended its range of energy-efficient gas fires to include new glass fronted models with efficiency ratings up to 85%. Gas is still the cheapest form of secondary heating, CVO Fire, at over 70% cheaper than electric or wood. These new fires are room sealed, require no additional room ventilation and will suit any property with a chimney. The sleek modern design is operated by remote control with thermostatic operation. This increases the energy saving potential of the fire. 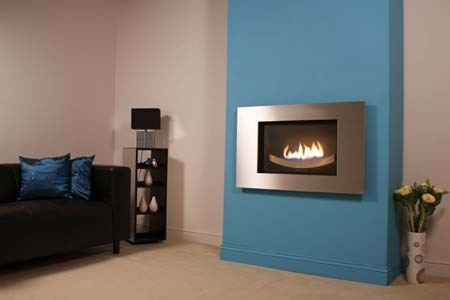 All fires are CE approved and have heat inputs up to 4.6kw and running costs as little as 15p/hour. The CVO gas fire range includes many styles including flueless, balanced flue and chimney visit website or call for further details. 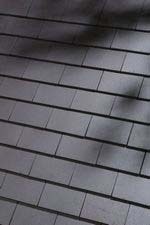 A new clay roof tile colour matching the appearance of solar panels has been launched Dreadnought Tiles. The West Midlands-based manufacturer launched its new dark Staffordshire Blue in response to customer requests – and is now finding it’s much in demand with architects and clients wanting to make solar panel installations blend in with the surrounding roof. The new dark Staffordshire Blue is deeper and richer than previous blue colours, matching the colour of Staffordshire Blue bricks. It is available as a machine-made (in both sandfaced and smoothfaced finishes) and also in the new Classic Handformed version. Insulating concrete form (ICF) wall systems from ICF Tech can deliver energy efficient, low and zero carbon homes. Architects, builders and developers challenged with meeting SAP 2009 will benefit from using the UK designed and manufactured ICF Tech systems as their design already incorporates characteristics and features that surpass the assessment procedure’s rigorous thermal demands. With build methods such as brick and block, under SAP 2009, party wall cavities must to be sealed and filled to achieve the highest ‘zero’ U-value level – unlike the automatic 0.0 U-value assumption under SAP 2005. Using ICFs eliminates this issue completely as it is monolithic by nature and insulated on both sides of the concrete cavity – thus achieving the 0.0 U-value. Additional ICF advantages are delivered in relation to the thermal bridging calculations required by SAP 2009. 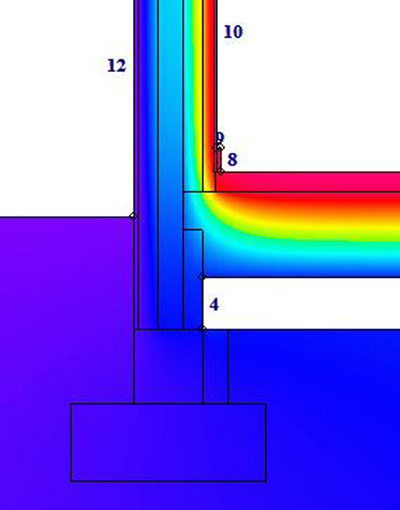 ICF Tech has modelled all the important junctions to determine a psi value for each one. This enables a true Y-value for the development to be determined by using a Design Y value (psi x linear length of junction) to achieve a value as low as 0.012 for detached homes. The inherent characteristics of ICF construction also offer the thermal mass benefits of heavyweight construction and a greatly reduced risk of summer-time overheating which SAP 2009 aims to identify. This is due to ICF’s ‘decrement delay’ – the time (in hours) that a structure stops the passage of heat from the outside to the inside. Figures of between eight and 12 hours are considered optimum, but ICF Tech’s system achieves nine hours which compares extremely well with the three hours expected of some timber frame systems. The Riomay advanced solar thermal system forms part of a simple, yet highly efficient energy transfer system that can heat water throughout the year. Whether the system is domestic, commercial, small or large, the principle is the same. The Riomay’s DF120 can be installed flat on a roof, at an angle, or horizontally on flank walls. 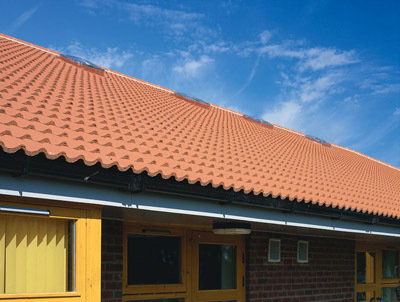 The panels have been used as a attractive architectural features on homes, schools, leisure buildings and pergolas.